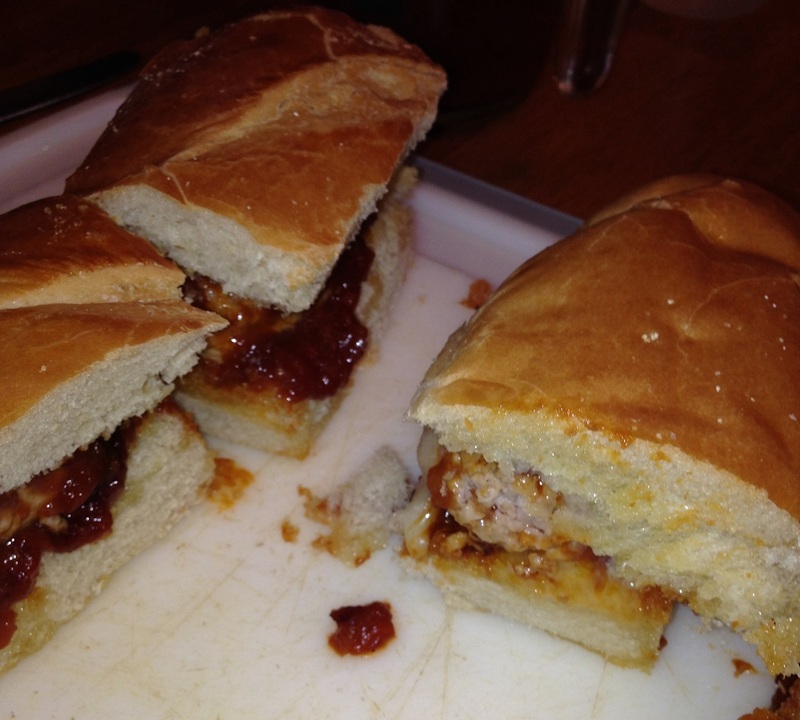 I can honestly say that I have never had the McRib sandwich, as un-American as that may sound. The whole idea of it kind of grosses me out, so I have stayed away from it, however I do like the idea of having a rib sandwich. As much as I would like a rib sandwich, I don’t know if I want to go through all of the trouble of cooking boneless ribs for hours just for a sandwich either, saw when I saw this recipe from Jeff Mauro, the Sandwich King on Food Network, I thought it sounded good and was certainly worth a try. He calls it a smoky barbecued riburger that uses a homemade barbecue sauce and some ground pork to make a burger-type sandwich. Put it on some garlic bread and you seem to have something pretty irresistible to me. For the barbecue sauce: Heat the vegetable oil in a medium saucepan over medium heat. Add the garlic and the onions and saute until they are soft, about 4 minutes. Add the ketchup, crushed pineapple, molasses, vinegar, sugar, mustard, Worcestershire and the chipotles. Simmer uncovered, stirring often, until the mixture is thickened, about 15 to 20 minutes. Remove the sauce from the heat and blend it with an immersion blender until it is mostly smooth. Reserve. For the pork burgers: Preheat a grill pan or skillet to medium-high to high heat. Form the ground pork into long and rectangular patties that fit the shape of the bread, keeping in mind that there will be 2 patties per half of bread. Sprinkle the exterior of the patties with salt and place them on a hot grill top for 3 minutes. Flip the patties and cook them for another 3 minutes. Turn off the heat and baste the patties generously with the barbecue sauce. 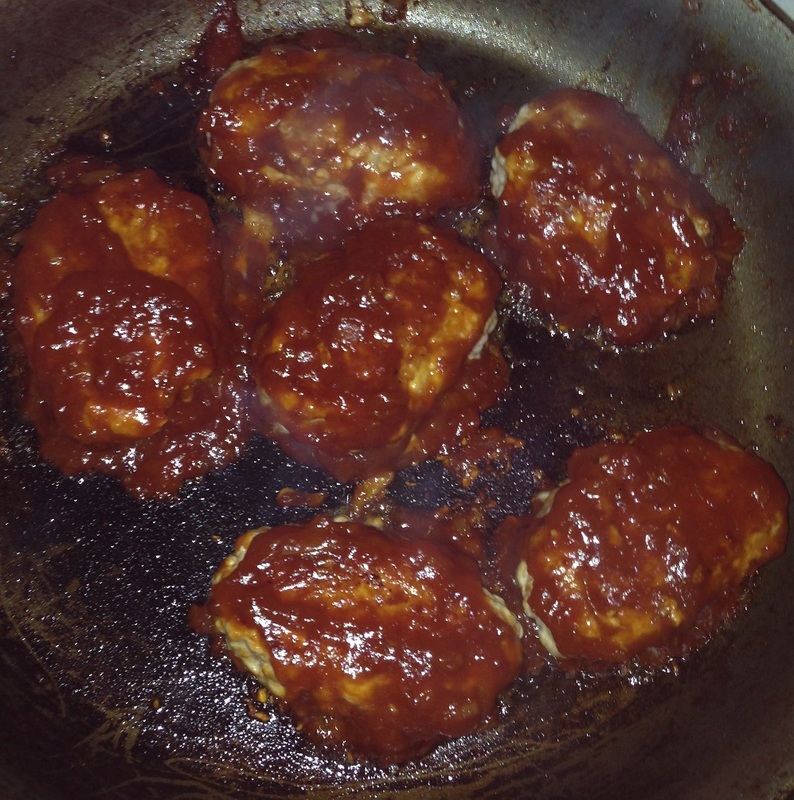 Flip the patties and continue cooking for about 2 or 3 more minutes, continuously flipping and basting the burgers. For the garlic bread: Place a rack in the middle of the oven and set the oven to broil. Mix the melted butter with the garlic and brush the mixture on the cut sides of the bread. Top with the mozzarella cheese and place the bread under the broiler just until the edges are lightly crisped, about 2 minutes. For the sandwich build: After your garlic bread is done, place 2 burgers on each bottom half of bread. Top the burgers with some pickles and the top half of the garlic bread. Slice each portion in half, yielding 4 sandwiches. Serve with the remaining BBQ sauce on the side. These burgers were very easy to make and tasted great. They offer a nice change from a traditional burger and the barbecue sauce had a nice flavor with the mix of pineapple, molasses, Worcestershire and chipotles. You could certainly skip making the barbecue sauce and use your own favorite bottled sauce instead if that is what you are going for. We all really enjoyed having the burgers on the garlic bread, which seemed to make them even better and I had enough sauce leftover that I can use it for other things like ribs. It’s definitely a recipe worth giving a try. 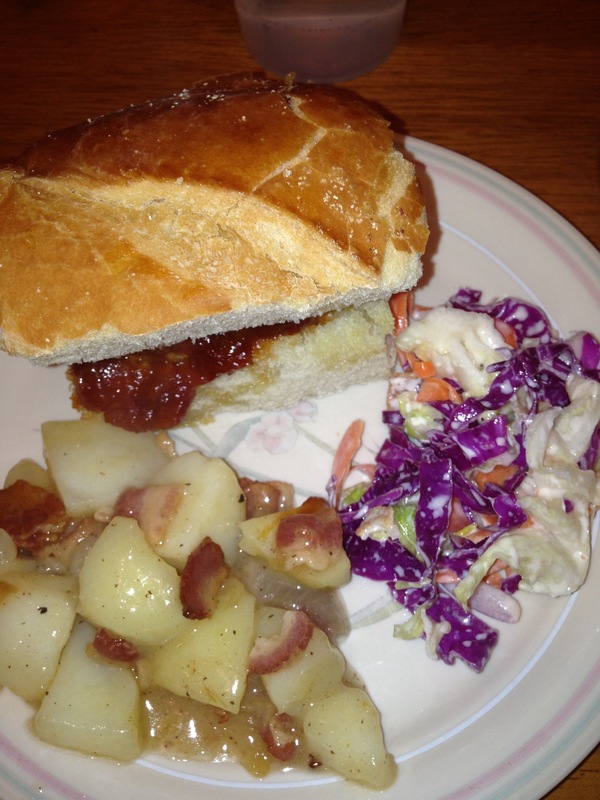 I served the sandwiches with some German potato salad and a new coleslaw recipe I tried, which I will be sharing tomorrow. That’s all I have for today. Check back tomorrow as I will be sharing a couple of side dishes I made with burgers this week – a buttermilk coleslaw with bacon and cornmeal crusted onion rings, both very tasty and easy to do. Until then, enjoy the rest of your day and enjoy your meal!